Borja Natural Products are the result from applying advanced technology: Fruit growing under physical-chemical control, maintaining the nutrive fruit quality. Low Acidified Banana Puree with Ascorbic Acid Added, with Seeds (PA). Borja Banana Puree is produced from fully ripened, mature cavendish bananas. It possesses a light cream color and a full banana flavor, free from all off-flavors and off-odors. Ascorbic acid, ppm...................................150 - 300. Packaging: Aseptic metallized bag in carton box of capacities of 6 or 55 or 220 gallons; or 55 gallon bag in metal drum. - 880 cartons............................each 21 kg net (= 5 usg). - 700 cartons............................each 26.3 kg net (= 6 usg). - 80 cartons/drums....................each 230 kg net (= 55 usg). - 20 cartons..............................each 920 kg net (= 220 usg). Net weight per 20 feet standard container is 18.4 mt. approx. - Room temperature, 22°c preferred. - Do not freeze if original package has not been opened. Natural Banana Puree, 100% Banana, with Seeds (N). Ascorbic acid, ppm...................................30 - 150. Natural Banana, 100% Banana, without Seeds (NS). Borja Banana Puree is produced from fully ripened, mature Cavendish bananas, peeled, homogenized, thermally processed and aseptically filled in bag in box or drums. It possesses a light cream color and a full banana flavor, free from all off-flavors and off-odors, without any acid or preservatives or sugar added. - Aseptic metalized bag in carton box of capacities of 21 Kg, 275 Kg, 1000 Kg, 1100 Kg or in bag in metal drum of 55 gall(230 Kg) capacity. - Also available aseptic packaging of 1 liter. It is not necessary the cold transport, but we recommend keep the product away from direct heat. - Keep the product away from high heat, direct sun, poisonous or ill smelling articles. Not sugar added, nor any additive added except ascorbic acid. Low Acidified Banana Puree with Citric and Ascorbic Acid Added, with Seeds (P-A). Ascorbic acid, ppm...................................150 - 300 seed. Ascorbic and citric acids added. Not sugar nor any additive added, except ascorbic and citric acid. Ascorbic and Citric Acid Added. Acidified Banana Puree with Citric and Ascorbic Acid Added, with Seeds(A). Ascorbic acid, ppm...................................150 - 350. Acidified Banana Puree with Citric and Ascorbic Acid Added, whithout Seeds (AS). - Aseptic metalized bag in carton box of capacities of 21 Kg, 275 Kg, 1000 Kg, 1100 Kg or in bag in metal drum of 55 gall (230 Kg) capacity. "Borja" Banana Puree is produced from fully ripened, mature cavendish bananas from the plantations, hand peeled, sieved and homogenized, thermally processed and aseptically filled in bag in box or drums, free from pathogenic microorganisms. It possesses a light cream color and a full banana flavor, free from all off-flavors and off-odors. The banana puree is prepared with special care under good manufacturing practices, so that residues of those pesticides which may be on raw material do not remain or are reduced to the maximum extent possible. 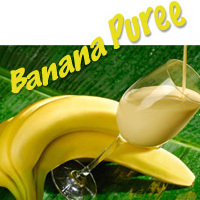 The banana puree is free from residues of hormones, antibiotics and other contaminants. Borja Organic Banana Puree is produced from fully ripened, mature organic cavendish bananas. - Aseptic metalized bag in carton box of capacities of 21 Kg, 26.3 Kg, 230 Kg, 275 Kg, 920 Kg, 1000 Kg, or in bag in metal drum of 55 gall (230 Kg) capacity. Borja Organic Banana Puree is produced from fully ripened, mature organic cavendish bananas. It possesses a light cream color and a full banana flavor, free from all off-flavors and off-odors. - 880 cartons each 21 kg net (= 5 usg). - 700 cartons each 26.3 kg net (= 6 usg). - 80 cartons/drums each 230 kg net (= 55 usg). - 20 cartons each 920 kg net (= 220 usg). Borja Organic Mango Puree is produced from fully ripened, mature mangoes. 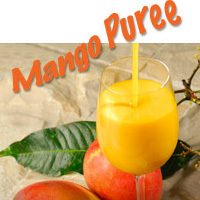 It possesses a bright yellow to orange color and a full mango flavor, free from all off-flavors and off-odors. - Aseptic metalized bag in carton box of capacities 6 or 55 gallons; or 55 gallon bag in metal drum. New weight per 20 feet standard container is 18.14 mt. Approx. - Keep it away from: high heat, direct sun, poisonous or ill smelling article. Packaging: Aseptic metallized bag in carton box of capacities 6 or 55 gallons; or 55 gallon bag in metal drum. - 80 cartons/drums each 230 kg net (= 55 usg) Net weight per 20 feet standard container is 18.14 mt. Approx. Storage: Once the product has arrived to the warehouse it is recommended to mantain it under refrigeration for better conservation of its physical and chemical properties. 10°c preferred. Do not freeze. Borja Mango Puree is produced from fully ripened, mature mangoes (tommy atkins, keitt, Haden), which pulp is homogenized, thermally processed and aseptically filled in bag in box or drums It possesses a bright yellow to orange color and a full mango flavor, free from all off-flavors and off-odors, without any preservatives or sugar added. - Aseptic metallized bag in metal drum. - 80 Drums.........................each 227 kg net (= 55 USG). - Net weight per 20 feet dry standard container is 18.14 MT Approx. - It is not necessary the cold transport, but we recommend keep the product away from direct heat. - It is recommended to maintain it under refrigeration for better conservation of its physical and chemical properties.